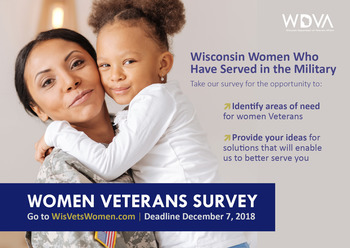 The Wisconsin Department of Veterans Affairs (WDVA) Women Veterans Program invites you to take a survey that will help us to identify issues that concern women Veterans and develop programs and services that address your needs and reflect your interests. We want to ensure the WDVA is positioned to provide programs and services to help you attain your goals, as well as assist you in connecting to resources and accessing benefits you have earned. The comprehensive women Veterans survey is being done in partnership with the University of Wisconsin Survey Center. We expect the survey to take about 15 minutes to complete. Please seize this opportunity to provide your insights and honest feedback. If you have ever served in the military – regardless of component, length of service, or era – we need to hear from you and learn what we can do to continue to improve in areas that are important to you. Order Your Capitol Ornament Today! The 2018 Wisconsin State Capitol ornament is now available for order. This year's ornament is a tribute to the badger statue located at the entrance to the governor’s office on the first floor of the State Capitol. The bronze statue was created as a gift from the people of the state of Wisconsin for the battleship USS Wisconsin (BB-9) in 1899. 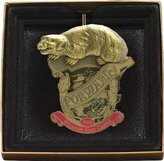 The badger statue was designed by artist Paul Kupper of Milwaukee for the USS Wisconsin (BB-9) and made with bronze salvage from Spanish cannons captured in Cuba during the Spanish-American War. The statue was designed to include the state motto “Forward.” The shield also holds a plow and fouled anchor, which were part of the “arms of the commonwealth.” The statue was placed on the bridge of the ship located directly above the thirteen guns. 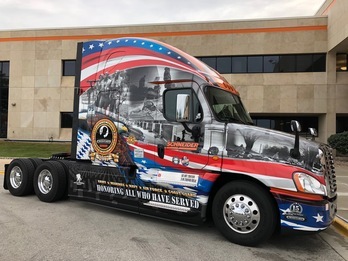 Active duty and recently-discharged members of the United States Armed Forces may now use the training and experience they received during their military career to obtain a Wisconsin commercial driver license (CDL). The U.S. News and World Report has rated five Wisconsin Veterans Homes, including three at the Wisconsin Veterans Home at King, as Best Nursing Homes in its 2018-19 Nursing Home Finder. Join us for an evening of dancing and fun as you step back into the 1940’s with the Wisconsin Veterans Museum Foundation at HOME FOR THE HOLIDAYS, A Dance in the South Pacific on Pearl Harbor Day, December 7th at The University Club in Madison. Enjoy this WWII-era experience, where you will be greeted with Polynesian dancers from Hale O Malo from Milwaukee, have a photo op with the dancers, enjoy signature cocktails and hors-d’oeuvres, dance all night to the music of Ladies Must Swing, and take beginner swing lessons at 7 PM. Period dress encouraged and prizes awarded to best dressed. Register Now! The Wisconsin Department of Veterans Affairs works on behalf of Wisconsin's veterans community — veterans, their families and their survivors — in recognition of their service and sacrifice to our state and nation. For more information,visit www.WisVets.com.